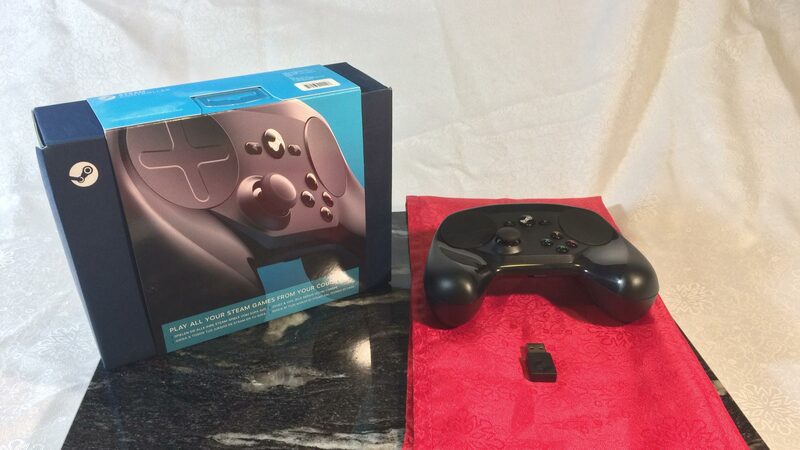 When the Steam controller was released to a skeptical gaming public in November of 2015 there were already more than a fair amount of detractors. Many couldn’t see how this new control scheme could compete with the precision of a keyboard and mouse. Others looked to the customization options and the dual trackpads and saw opportunity. So now more than a year after release what’s the verdict? As with everything else, Australia is late to the party. The Steam Link and the Steam Controller have just begun being sold through EB Games; a place I ceased to have any use for after Steam got popular and JB Hi-Fi started selling console games. Even now with EB Games literally being the only game in town for the Steam controller I was able to circumvent them and order the thing off Amazon for a healthy price reduction; something I’m sure EB will be keen to stop. So how does it work? Well the trackpad on the left emulates a mouse wheel by scrolling up and down as you make circles on it. The trackpad on the right acts as a straight pointer replacement. Surprisingly both of these things feel good. With very little investment of my time I was zipping all over the desktop clicking and dragging with almost the same precision as a mouse. This would be a recurring theme with the Steam Controller. Almost as much precision as a mouse. The first game I tested it was was Endless Legend; a 4X staple in this household. I’m pleased to report that the Steam Controller worked very well for this style of game. I was able to sit back and relax and just enjoy the game. After an hour I forgot I was even using the thing. When you bring up the configuration pane, either via right clicking the game in Steam or selecting it in Big Picture mode, you’ll be presented with the developers Steam Controller configuration if it exists. However the story doesn’t end there. You can select a bunch of configurations provided by the community or you can build your own. Sites like http://www.steamcontrollerdb.com/ will also offer configurations you can download and apply. However the curation is missing inside Steam. You can see the configurations but there is no indication which is the most popular or highest rated. However if your game has been out for a while you can guarantee someone’s made a configuration for it. The customization rabbit hole goes deep and wide. You can emulate mice, controller sticks, joystick pads, button pads, radial menus and more. You can even design a touch-pad menu with weapon icons and dedicate a portion of each pad to selecting each one if you wish. There certainly is no lack of customization options but this might be daunting for someone who just wants to jump in and play. The next game I tried was Fallout 4, and it was much harder to configure. I had to mess with the controls a bit to find a scheme I liked and then I had to fight Fallout 4’s config and turn off the controller support to get things working properly. Things seemed good at first but as soon as I entered combat I choked and backpedaled into a corner where I was pummeled. Was this a lack of training or an inferior controller. Only time will answer that question. I’m old enough to remember my transition from arrow keys in Doom to mouse control in Quake, and even though I’m a mouse and keyboard cheerleader I can still remember the change being less than seamless. The last game I tried was Wube Software’s Factorio. This game was a treat with the Steam Controller. I instantly felt in the game and felt the lack of precision hindered me only slightly. I quite happily laid down mile after mile of conveyor belts before I realized I had been playing for a few hours and needed to get something else done. The only thing I didn’t do in the game was engage in combat which I suspect might highlight some of the flaws. Despite these issues the controller has some neat party tricks. The ability to use the gyros to precision aim while using a track-pad is inspired. Usually this type of control scheme would lead to the player contorting themselves to gyro aim, but since you can choose to engage the gyros only when track-pad is being used it makes it great for slight adjustments. Probably the feature I like the most is the on-screen keyboard. The controller splits a regular keyboard in two and allows you to two-finger type using both the track pads at once. You don’t even need to be in big picture mode to use it, just click the stick down and it will pop the keyboard up. This would be very handy in a home theater environment. Is it over? Is there a definitive answer as to whether the Steam Controller is worth it? Not yet. Although I suspect the controller will be outclassed by established control schemes in some cases there seems to be enough middle ground to make this control scheme attractive. I think it will definitely find a niche with those who play games on the couch or have home theater PCs. The on-screen keyboard alone allows this controller to fill the spot on your couch previously occupied by a mouse, keyboard and controller. As for me it’s going to take a bit more training to figure out if this is something I stick with.